Misplaced Priorities in Addiction Treatment? 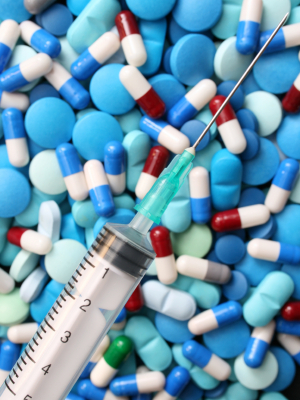 Can an addiction be treated with a drug? Imagine: a simple pill to satisfy all of one’s cravings for drugs or alcohol, and to avoid the ravages of this disease. It would revolutionize our treatment of addiction. And since we’re constantly told that addiction is a brain disease, it only makes sense that, once we understand the underlying biology, we’ll be able to create just such a pill, right? Countless researchers, labs, and pharmaceutical companies are indeed trying to do this, as we speak. The addict struggling to get clean might scramble to be first in line to receive this magic pill. The recovered addict, on the other hand, would probably argue that a chemical solution, a “drug to end all drugs,” so to speak, is far too simplistic. Addictions are behavioral, psychological, social, and spiritual problems (and, yes, they also have some underlying neurochemical factors, too). A pill may treat withdrawal symptoms, or help to reduce the complications of intoxication, or to minimize craving, but even if that pill is 99% effective in reducing cravings, or preventing the intoxicating effect of a drug, the addict will always look to achieve that 1%. It’s how the disease works. I mention this not only because I am familiar with the recovery process (including the twelve-step approach, which is decidedly not pharmacological but is probably the closest thing we have to an “effective treatment”), but I am also familiar with how well-meaning professionals often trivialize addiction and recovery. Our own biases sometimes keep us from recognizing what should be obvious. A good example is in the January 2011 American Journal of Psychiatry, which contains a letter to the editor suggesting that disulfiram (commonly known as Antabuse) ought to be investigated for its “anticraving” properties. They point out that disulfiram may increase levels of dopamine in the brain, and since dopamine is “involved” in reward (and addicts sometimes have decreased dopamine activity in the reward pathways), it may reduce craving for addictive drugs and behaviors. My reaction to the letter in the journal is not that the authors were factually incorrect, or that we shouldn’t study disulfiram and its properties, but that their argument misses the point. Despite decades of experience with Antabuse, we still have alcoholism and other addictive behaviors, so obviously it’s not a magic bullet. 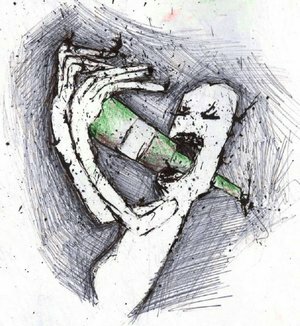 And people who take Antabuse still crave alcohol, so it doesn’t reduce craving to any meaningful degree (in fact, one of the arguments against using Antabuse is that people who want to drink– which is, unfortunately, most alcoholics– simply stop taking it.) The authors cite a case study in which a patient’s desire to gamble “disappeared completely” after taking Antabuse, but as with most everything in psychiatry, how do we know this had anything to do with the drug? It’s quite naive to think that a simple pill will work in an addiction when addictions are far more complex entities. It reminds me of the doctor who chooses Wellbutrin instead of a different antidepressant for a depressed patient “because she smokes” (the active compound in Wellbutrin, bupropion, also sold as Zyban, has been shown to be effective in smoking cessation). Or the doctor who prescribes Suboxone for the daily Oxycontin and Vicodin addict. Or the doctor who adds Topamax to the regimen of the obese bipolar patient (because some studies show a modest decrease in food craving). These are not bad ideas (and yes, I’ve seen them all), but again they miss the point. The depressed smoker isn’t going to give up nicotine because she’s all of a sudden taking Wellbutrin. The opiate addict won’t unlearn his addictive behaviors and mindset because he’s now taking Suboxone. I know that none of the experts in the addiction field would ever suggest that a medication will solve any individual’s (much less society’s) addiction problem. But I’m concerned about the non-expert clinician, who has neither experienced nor witnessed true addiction. I’m also concerned about the addict, who sees a news headline about some new anti-alcoholism or anti-obesity pill and believes that the wonders of modern science will cure his addiction (so he doesn’t have to look at his own problems). We in the field also need to be careful about what we promise our patients, and understand the limits of our science. Perhaps we should go one step further and scrap the science altogether, and instead focus on other ways to understand what drives our patients to drink or use drugs, and emphasize a more comprehensive approach to recovery– and yes, one that will require the addict to do a lot more than just take a pill. This entry was posted on Monday, January 31st, 2011 at 4:38 pm and is filed under addiction, medications. You can follow any responses to this entry through the RSS 2.0 feed. You can leave a response, or trackback from your own site. 22 Responses to Misplaced Priorities in Addiction Treatment? So Steve, how many addicts will you let die while we search for the "cure?" Like much else in medicine, sometimes we have to settle for less than perfect. Buprenorphine has been a godsend for opiate addicts. We have nothing else to offer them, other than methadone, that works at all. As for naltrexone, it sometimes allows an alcoholic to feel like that one drink she just had is really enough. Has it converted an alcoholic brain to a non-alcoholic brain? Maybe not, but it's close. And can you really say abstinence is better without getting all moral about it? You really miss the point with disulfiram. The alcoholic is not supposed to take it to get an aversive reaction. They do something like that at Schick where the patient drinks his favorite booze and is given a drug that produces nausea every other day for weeks. Disulfiram is a deterrent to drinking. It provides a time buffer: The alcoholic knows he has to stop taking it for a week or so before he can drink in comfort. We hope after a few days he comes to his senses, maybe has a talk with his sponsor, and resumes taking the drug. Acamprosate, topiramate and maybe gabapentin can reduce cravings as well. And you omitted varenicline which works with nicotine receptors the same way buprenorphine works with opiate receptors. Bupropion may only help a genetic subset stop smoking. Too bad we can't predict whether or how well the rest of these drugs will work in a given addict, but fortunately they're for the most part safe enough to audition while you try to get the patient to attend AA. How many addicts will I let die? Seriously? Zero. Just because we don't have a "cure" for addiction (and I frankly don't think we ever will) doesn't mean I cannot, or will not, treat a patient in need. The same can be said for all of psychiatry, and much of what we do in medicine. A treatment that is only 60% effective (or works only 60% of the time) is still far better than nothing.I prescribe Suboxone, I prescribe Antabuse, and I prescribe Topamax. I agree that buprenorphine and other replacement therapies have proven remarkably useful in addiction treatment. The point I'm making in my post is that treatment doesn't stop there. In reality, it's just a start. But I've seen too many well-meaning professionals draw the conclusion that they can prescribe a medication that supposedly helps with "craving" and — voila! — they've "treated" the addiction. In fact, I would argue that this approach gives the addiction more of a foothold in which to establish itself. Thanks for the comment. I am planning to write more about the phenomena of “reward” and “craving” because I think the modern addiction-medicine paradigm (and certainly the animal models) miss the point. To put it briefly, addictive substances/behaviors are highly rewarding and people certainly crave them; but the addict craves, and is rewarded by, an entirely different aspect of the target of his/her addiction. By the way, regarding Topamax and other “anti-craving” drugs: even if a drug like this eliminates 99% of all cravings, the addict will always find a way to thrive on that remaining 1%. Something to keep in mind when thinking about drug treatments for addiction. Can you take topamax & antabuse? page, and your views arre nice for new viewers. Egg Bowl away from Jackson, Miss. more. Thanks for excellent ibfo I was looking for this information for my mission. this tropical villa escape, complete with the most popular conveniences of this day and age. body as can be provided. The gates of hell are closed during the holy month of Ramadan and satan is locked up. Hello, Hi guys. Always interesting to read peoples opinions on this topic. I have a blog which summarizes why private Embankment Stair residential treatment is better. The short answer is essential that people from residential treatment are less likely to relapse. It is truly a nice and helpful piece of information. I am happy that you just shared this helpful info with us.